As I reflect on the life of Henry David Thoreau (1817-62) in the month of his 200th birth anniversary, I am overcome by the realization how distant his time is to ours, and yet how close, familiar and intimate his spirit is to us now, especially in India. I read his diaries ~ to be exact, a selection from his diaries in the superb German translation by Susanne Schaup ~ and I was deeply affected. What a pure, crystal-clear spirit speaks to us through these pages! He reaches us directly, bridging the historical space. He in his prime ~ he only lived to be 44 years ~ achieved a maturity of thought and character, and especially a depth of feeling which is ageless and which has the colour of eternity. By which means did he achieve this? By being intimately at home within nature, and by rigorously following his conscience. He lived within nature not just philosophically, not merely as an idealist or a romantic or a writer, but existentially. Nature was his ‘heaven’ of which he knew every nook and corner, every seed and fruit, every leaf and root. Of all plants and flowers he could give the names, he knew their life patterns and their medicinal value. He knew the intimate workings of a tree like a mother senses the needs and desires of her baby who is too young to articulate himself. For example, Thoreau penned a long essay on the wild apple trees in his wider vicinity in which he waxed enthusiastic about their different scents at different seasons, about their varying taste indicating the stages of ripeness. But no sentimentality in the descriptions of his long walks through the wilds! No hymnal adoration of the Forest, as for example the German Romantics were addicted to, no ‘In Praise of Trees’ (briksha-bandana), as Tagore loved to extol the inexhaustible cosmic vastness of life in which the tree became but a symbol. His emotional and intellectual affinity to Indian thought is obvious, and indeed, Thoreau admired the Bhagavad-Gita and quoted from this and from other scriptures. Does not Indian philosophy also postulate that right living is not merely to speculate and formulate ideas, but to prove them right by living them? And does not Thoreau’s radicalism reflect an ascetic ethos akin to the sanyasa ideal? And does his life-style not bring us a fresh breeze from the Mahabharata and Ramayana with their descriptions of an idyllic, yet harsh, ashram life where beauty and hardship mingled? Thoreau remained unmarried; he lived mostly alone (Walden has a chapter on ‘Solitude’); he had an unsteady job. He earned a living as a land surveyor and from the family’s pencil factory. For a time he was a teacher as well. He abandoned his job when he was advised to resort to corporal punishment to discipline his pupils. His conscience could not accept this. 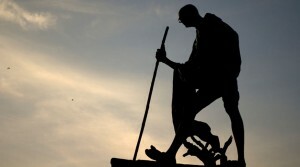 The essay culminates in the depiction of a scenario which Mahatma Gandhi emulated half a century later: ‘Under a government which imprisons anybody unjustly, the true place for a just man is also a prison.’ In fact, as Gandhi would do later in different circumstances, Thoreau refused to pay his taxes as it would ‘enable the State to commit violence and shed innocent blood.’ Thoreau went to prison, an experience he described minutely in Civil Disobedience. It was only for a night because a relative paid his taxes instead. Thoreau was not grateful, rather he thought that this man’s ‘private feelings’ had interfered ‘with the public good.’ Gandhi repeatedly mentioned in his newspaper, Indian Opinion, that he profited greatly from Thoreau’s essay and that it had inspired him to also read Walden and other writings. It is obvious that Thoreau was an enemy of wealth and of the machinery which creates personal wealth ~ capitalism. He felt that wealth is a hindrance to the inner life, and professions which just serve to amass it, and like everything connected with business, crushes the life of the spirit. As usual, he was most stringent in his pronouncements. 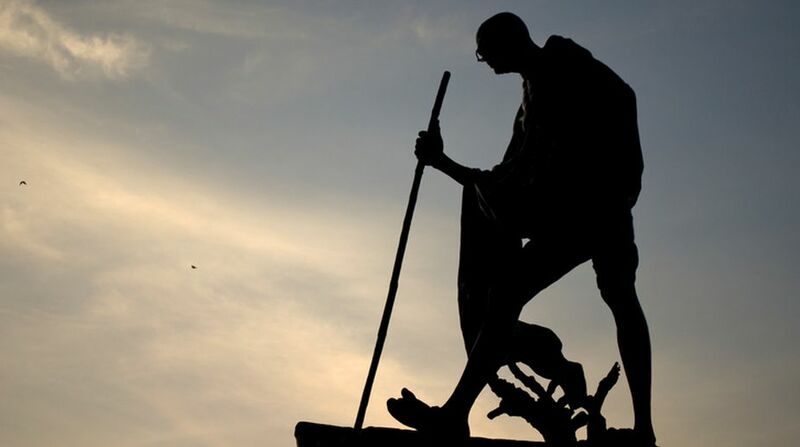 His equally famous essay, Life Without Principle, makes it brutally clear ~ ‘I think that there is nothing, not even crime, more opposed to poetry, to philosophy, ay, to life itself, than this incessant business.’ Possibly even Gandhi expressed milder views. Here we come full circle: Simplicity in nature brings forth our poetic faculties; wealth, business, the very opposite of simplicity in nature, destroys them. We have a choice.